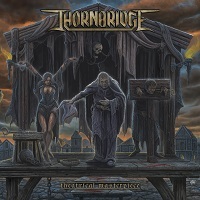 German power metal quartet THORNBRIDGE releases their second incarnation “Theatrical Masterpiece” 8th of February via Massacre Records. The theme of the album primarily deals with torture and oppression in the Middle Ages, particularly during the times of inquisition and witch-hunting. Music wise, what you’ll get is an old school Blind Guardian-esque sound with a much bigger use of choirs. The first thing I noticed upon playing the album is its total playing time. Despite having eleven tracks in it, the album only has a total of 45 minutes playing time. Two of the tracks are actually the instrumental intro “Take to the Oars” and outro “The Dragon’s Sleeping”. I have to mention that although “Take To The Oars” is a truly appetizing intro, it doesn’t connect cleanly with the first song “Theatrical Masterpiece”. I was expecting that after the last note of the intro, the following song will follow its tune to pick up where it left off, just like RHAPSODY’s opener “Epicus Furor” for “Emerald Sword”. But that’s not a big issue to affect the integrity of either of the tracks for “Theatrical Masterpiece” is a really amazing song with lots of stuff going on. First and foremost is the way Lucky’s drum emphasized all the tempo shifts with such virtuosity. Next are their fine works on the riffs and the solos. The presence of multiple vocals did the job of creating a dynamic sound. The strength of this album is provided by its sharp riffs and blazing solos, and songs “Revelation”, “Journey to the Other Side”, “Trace of Destruction” and “Set the Sails” would loudly speak for it. The epic solos provide an even more epic feel given by the anthemic choirs at the choruses. And because every song is written in an almost completely similar format, you might actually find yourself waiting for the solo to come in. Still talking about solos, the guitar solo in “Demon in Your Heart” is what really caught my attention. While the song has a heavy atmosphere, the solo shifts direction in a flawless way. The sound of the solo? Well, at first you might feel like you are listening to an 80’s disco music – and the way they pulled it off was awesome! It transitioned quickly into a shredfest still in an oldie dance tune and ends it with a blasting drum break before the vocals comes back again in the same heavy mood as if nothing happened. In the seventh track “Ember In The Winter Grove”, I thought I’ll hear a power ballad. Instead, I was deceived – turns out, the acoustic intro is their way of knocking before kicking off a completely shifty song. As mentioned, this song is the shiftiest song in the album – in terms of the mood, the tempo and time signature. The song also features a growled vocals. For the outro “The Dragon’s Sleeping”, I’ll make the same comment as the intro. It doesn’t connect to the last song at all. Plus, because it’s an instrumental, the title becomes cryptic – does the title mean “The Sleeping of the Dragon”, or “The Dragon is Sleeping”? I can’t help but wonder. It’s a mellow acoustic decrescendo instrumental by the way, just so you can make your own guess. Overall, the album is an enjoyable one. The tunes are catchy, the choruses are big and anthemic, it’s got some nice and interesting solos, and most of all, it relives the legacy of old school German power metal (especially BLIND GUARDIAN) and gives it a modern touch. It’s indeed theatrical, but not quite a masterpiece considering its originality. But that doesn’t matter – it’s an interesting album with lots of cool contents.